Lisa Giunta is a 2011 graduate of the Columbia University School of Law and since her admission to the bar has been principally involved in litigation in the New York State and Federal Courts. 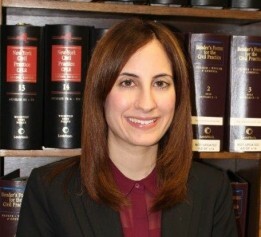 Prior to joining the law firm, Ms. Giunta completed a two-year clerkship with the Honorable Arthur D. Spatt of the United States District Court for the Eastern District of New York. She also previously worked for the Appeals Division of the New York City Law Department where she was responsible for drafting numerous appeals and arguing matters before various New York State Appellate Courts. While attending law school, Ms. Giunta was designated a Harlan Fiske Stone Scholar and served as the Head Notes Editor for the Columbia Journal of Transnational Law. Her note, entitled The Dead on Display: A Call for the International Regulation of Plastination Exhibits, was published by the Journal and was awarded the Student Writing Prize in Comparative and International Law (Louis Henkin Outstanding Note Award Winner).